I'm a huge fan of children's books, and especially making a tradition out of reading certain books at special times of the year. The challenge with Valentine's Day books is that they all too often have an ultra-girly cover and storyline, which isn't always appealing to little boys. 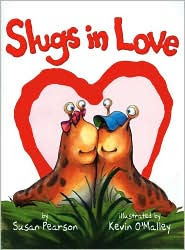 That's why I just love the book "Slugs in Love," written by Susan Pearson and illustrated by Kevin O'Malley. Despite the fact that the main characters are two very slimey slugs, this adorable story touches on the important lessons of love, fate and never giving up, without being overly ooey-gooey. Once you get over the ick-factor that your boys will love so much, you'll really appreciate "Slugs in Love" and the opportunity it gives you to snuggle up with the little ones you love most. Check it out at your local library or purchase it from Amazon.com.